Athletics facilities have struggled with bacterial infections. The world of sports (where skin-to-skin contact and moist conditions are common) provides a cozy life for bacteria. These bugs endanger athletes and may even end their careers. And despite the advances in medical science and facility education, it’s still a big problem. Let’s look specifically at MRSA in high school and college sports. Infection prevention now impacts every protocol: equipment handling, physical training—even shower schedules. Some locker rooms have placards detailing protocols for equipment storage and cleaning. Many universities have web pages that explain their prevention and treatment efforts. Demonstrating the school's defense against MRSA is not only a safety precaution. It's a recruiting tactic. Athletics department staff are aware of the issues. MRSA especially requires a purposeful, educated, targeted approach. This means participation from everyone: athletes, coaches, parents, executives, and those who influence decisions about facilities and the solutions they use. We’ll cover why MRSA in student athletes is such a big problem, and what athletic facilities are doing about it. There have been some recent scientific studies on the issue, so we’ll compare those results with current disinfection practices. The goal? Clarify what athletics facilities departments are up against when making infection control decisions. For those of us who design and specify in these environments, this is a complicated issue we need to understand. You may know about staph infections. 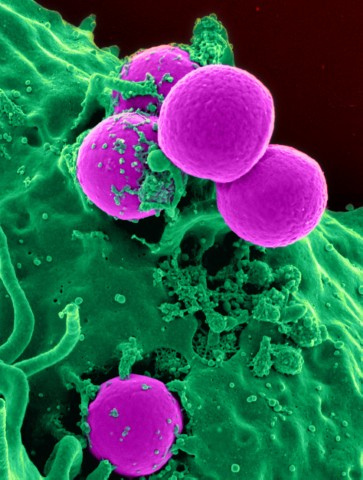 “Staph” is short for “Staphylococcus,” a genus of bacteria found on the skin or in the nose. There are many types of staph infections that can affect almost any part of your body. MRSA, or “Methicillin-resistant Staphylococcus aureus,” is a kind of staph—and it’s a big one. Staphylococcus aureus infections can be fatal if they aren’t diagnosed and treated properly. They can cause pneumonia, blood infections, bone infections, wound infections, and more. However, the first part of that MRSA acronym, “Methicillin-resistant”, is the scary part. Like other “superbugs,” this means that the usual antibiotics that treat staph infections do not kill MRSA. As such, it’s more difficult to treat, and crucial to protect against. Is MRSA on our skin and in our noses too? Yes. In fact, 25-30% of healthy people carry staph. MRSA specifically is carried by about 5% of people, without showing any symptoms of infection. Doctors call this colonization. Colonization is what makes it easy for the bacteria to be spread by unknowing carriers. How long does MRSA live on hard surfaces? According to the CDC, MRSA bacteria can live on surfaces for days or months. This depends on many variables such as temperature, humidity, bacteria count—even the texture of the surface (which impacts how easy it is to clean). 2. Why is MRSA such a problem in sports? Staph bacteria spread through direct skin-to-skin contact. Infections happen when that bacteria reaches broken skin. Think about how athletes move. They bump and graze one another all the time—even if they already have injuries. Scuffed knees, split lips, and even razor burns are inviting homes for MRSA bacteria. That’s why MRSA is the most prevalent in football and wrestling: two sports with high levels of skin-to-skin contact. Athletes can’t really change how much contact they have. So they should shower more, right? Well, yes. That definitely helps. But this can be difficult to regulate in high school athletics, where students are less willing to shower after every practice. And it’s not the only factor. Can you get MRSA from surfaces? MRSA in athletes also spreads through indirect contact. That means skin-to-surface-to-skin contact. A soccer goalie colonized by MRSA sits on a locker room bench. They get up to take a shower, and a teammate sits in the same spot. Maybe the teammate has a cut on the back of their leg. They are vulnerable to infection even if they never touch the goalie. Even if the bench was empty for hours between their contact. If no one cleans the bench, the risk of the teammate contracting MRSA in their wound is extremely high. Think about other surfaces. Weights, towels, showers, exercise machines, water bottles, training tables, and wrestling mats are all perfect layover cities for bacteria. 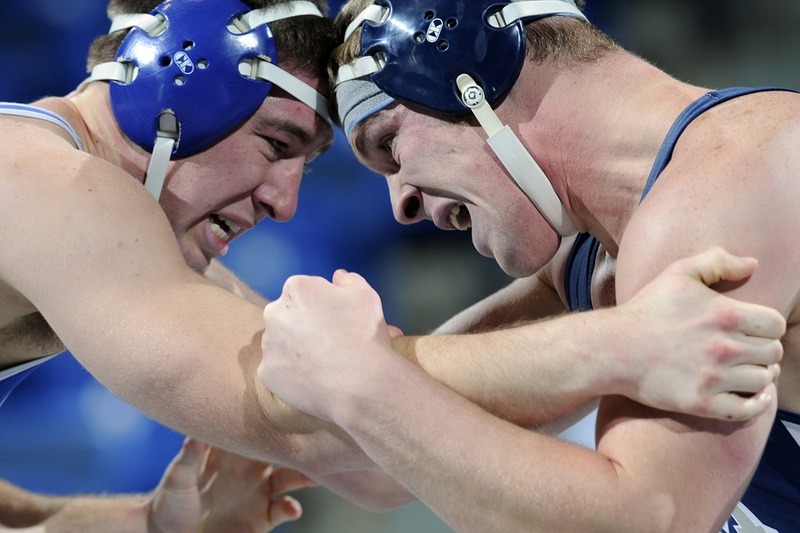 In fact, a 2010 study found MRSA on 89% of wrestling mats and 78% of locker room benches. “CA-MRSA Infection Rates and Management among Student-Athletes,” by Tim Braun and Leamor Kahanov, describes two long-term MRSA athletic facility reports in order to help educate the industry and inform future policy change. In football, one player in 140 contracted MRSA. In wrestling, it’s one player in 100. Those numbers have gone down since the previous year, but they are still huge compared to the general student athlete population. Their data further explains some of the characteristics we talked about and why MRSA is such an issue in sports. Remember colonization and indirect contact? Out of the facilities in this study, 51% reported at least two MRSA infections. Out of that group, 91% of infected student athletes were either teammates with another infected athlete or shared space with them (like a locker room or training facility). This suggests that their environment is a likely contributing factor in transmission. They found that infected athletes come in contact with locker rooms, showers, playing surfaces, weight rooms, athletic training facilities, tables, whirlpools, etc. Athletes can hardly avoid these areas. Once MRSA colonizes a student athlete, that athlete is seven times more likely to get an infection. If a student athlete is colonized or infected by MRSA but not showing symptoms, the risk of transmitting it to someone else is 40%. This could be a roommate, friend, classmate, professor, trainer, coach, etc. Going back to our previous example: that colonized goalie has a 40% chance of transmitting MRSA to their teammate via the locker room bench. MRSA has been known to colonize for 21-282 days. During that time, one student athlete can experience multiple infections. This makes it look like MRSA “keeps coming back” when in fact it never left. This is why MRSA is so hard to beat. It plays the long game. In sports, where direct contact, indirect contact, moisture, and injury cannot be 100% avoided, it’s difficult to withstand the siege. So we’ve covered antibiotic-resistance, colonization, bacterial lifespan, and indirect transmission. We’ve shown how the sports environment sets perfect conditions for each of these characteristics. Hopefully this illustrates why MRSA is such a formidable opponent. Facilities managers and sports medicine professionals know all this. They’ve responded with strict showering schedules and regular disinfection in high-risk areas. Some use intense all-over cleaning methods like hydrogen peroxide fog. These help. But they’re not a cure-all. And not every facility interprets these solutions in the same way. They have wide variations in budget, staff education, and school district protocols. Additionally, training student athletes about prevention does help reduce equipment sharing and bad hygiene. But that’s extremely difficult to monitor and control. All athletics facilities should be completely cleaned once a day. High-contact areas should be spot-cleaned multiple times per day. (For example basketball gym floors need to be disinfected more often than corridor floors). Sanitize mats and other high-use equipment before each practice and several times a day throughout a tournament. If an accident happens and biological material contaminates a shared area, it must be handled immediately. Athletes should clean all surfaces that contact bare skin (like weights, mats, massage tables, training tables, and therapy machines) between each use. Surfaces and equipment should completely dry before they are used again. Use a sanitizer or disinfectant registered for use against MRSA on surfaces, or use a freshly–mixed solution of one part bleach to 100 parts water. What Kills MRSA on Surfaces? Typically unsafe for continuous human exposure. These solutions are great for immediate sanitization after a contamination event and daily cleaning. These methods are safe for human exposure and should be used in combination with intermittent solutions. Germicidal visible light integrated with general lighting, safely and continuously protects the space and manages bacterial populations over time. Furniture design, like individual stools for each locker. Helps prevent the spread of bacteria. Bottom line: effective infection prevention in athletics facilities requires universal buy-in. When it comes to the athletics spaces themselves, many people are involved. According to the authors of the new study we examined, sports medicine professionals, athletic directors, and others have been on the front lines of this battle for years now, initiating program-wide changes and major rebuilding efforts. This means that while the proper urgency for infection prevention may be there right now, those indirectly connected to athletics are less educated. With more structure in place, facilities will continue to gain access to more research, more universally recommended procedures, and a better understanding of solutions and their efficacies. For our part, specifiers, manufacturers, and contractors should understand where athletics professionals are coming from so we can support development and offer the right solutions. © 2019. All rights reserved. Visa Lighting. Design Modifications.